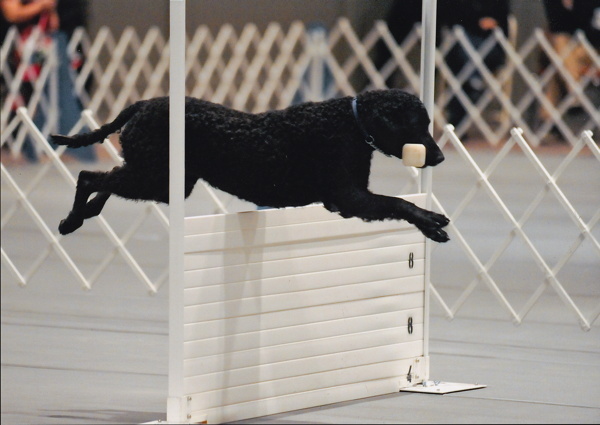 Diver and his grandson Dodger, doing the high jump at the AKC National Obedience Invitational. 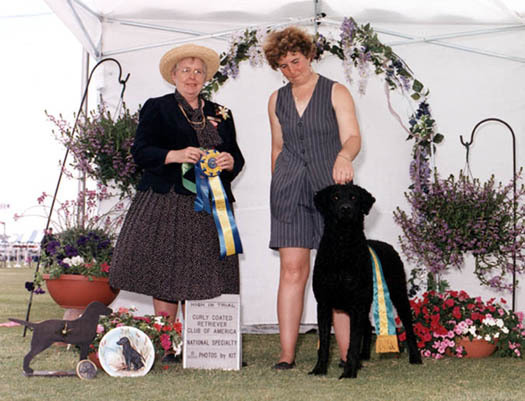 Ch/OTCh Karakul Joy of Summerwind,Am/Can UD, WC - "Joy" was the first Curly Coated Retriever OTCh and first High in Trial winner. 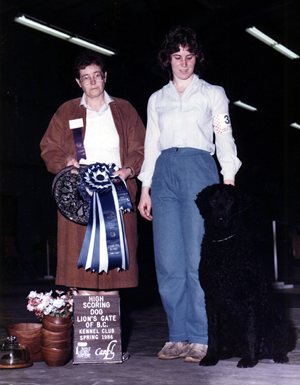 She won multiple all breed High in Trials in both the US and Canada. 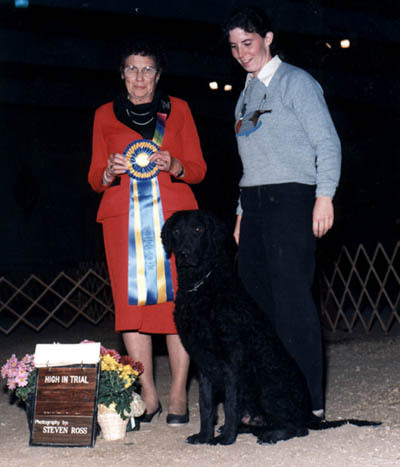 NBISS, Ch Charwin Scirocco,CDX,Can CD, WCQ, SH, ROMX, HOF, CGC - "Strutter" was a multiple all breed High in Trial winner in both the US and Canada, despite focusing primarily on his field career. 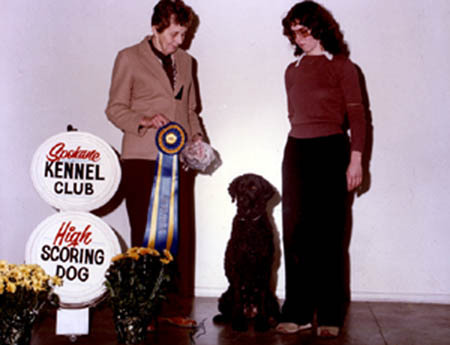 GMHR, Am/Can/FCI/Mex Ch,OTCh Charwin Diver Down, UDX3,Can UD,ASCA/Mex/UKC CDX,RE,OA,NAJ,NAP,NJP,WCQ,SH,HR,ROMX, HOF,CGC,CGN - "Diver" was a multiple all breed High in Trial winner in the US, Canada and Mexico, as well as a multiple all breed High Combined winner in the US, and a multiple CCRCA National Specialty High in Trial and High Combined winner. Diver was the most titled Curly in the world during his lifetime and may still be the top male, as well as a record holder in the field. 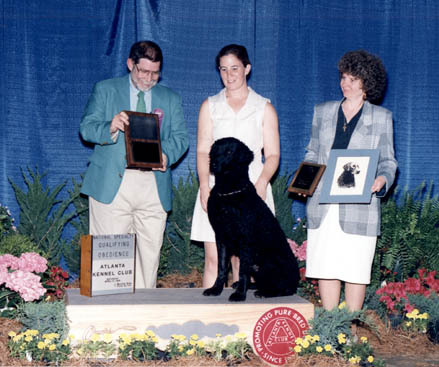 Ch/OTCh Charwin Ricochet,UDX,OM2,GO,U-UD,ASCA CD,WCQ,SH,RE,AX,AXJ,NAP,NJP,RSN,JSN - "Dodger" was multiple all breed & Specialty High in Trial & High Combined winner. 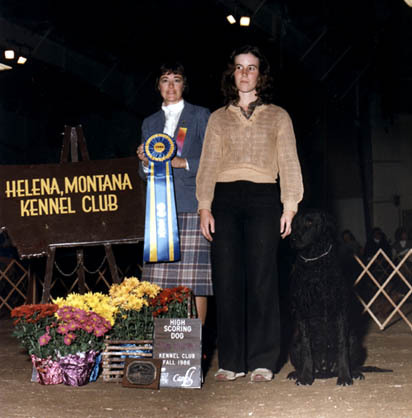 Ch/OTCh Kolipo Plan B For Charwin,UDX,OM3,RE,WCQ,SH - "Proxy" won an all breed High in Trial her first time in the ring, and has added many more. 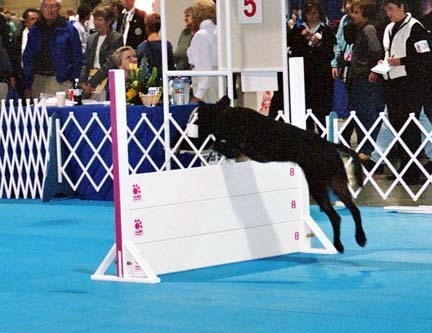 Ch/OTCh Charwin Iced Tea,UD,OM1,BN,RE,WCX,UWC,JH,NA,NAJ - "Teaz" is Proxy's daughter and Diver's granddaughter; a third generation OTCh, multiple all breed High in Trial and High Combined winner. Ch,U-Ch Charwin Outside The Lines, UDX, OM2, BN, RE, TKA, ASCA CDX & RAX, U-CD, CA, WCQ, UWC, JH, SR, SHR, CGCA, SPOT-ON - "Sketcher", Teaz's son, is a fourth generation multiple all breed HIT and High Combined winner. 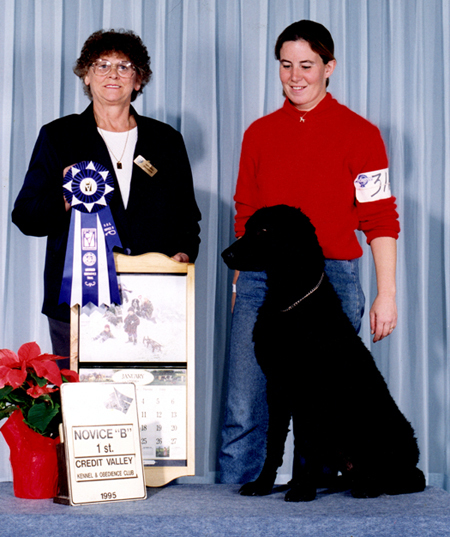 Ch Karakul Joy of Summerwind,Am/Can UD, WC winning High in Trial in 1983 from Irene Bourassa. 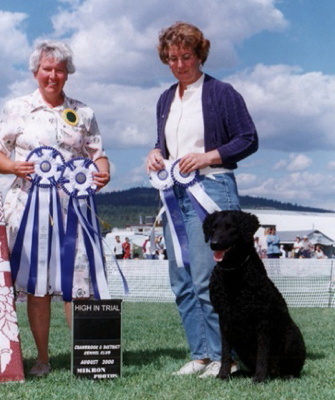 the one on the left from judge Mrs. H. Fulker & the right from judge Kathryn Marshall. Strutter wins a HIT in Canada under Virginia Lynne on 4/5/86. 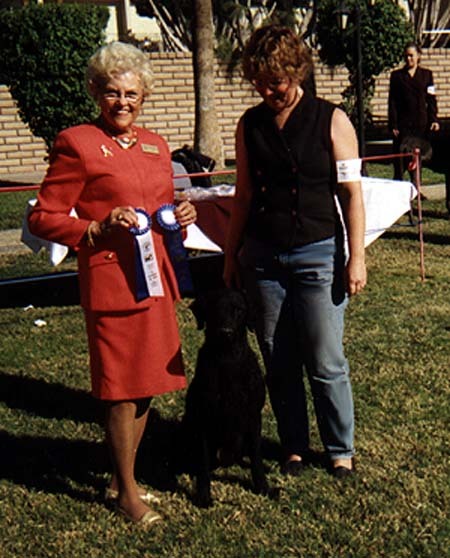 Ch Charwin Devilspawn,Am CDX,Can CD,WCQ,SH,WR,CGC wins High Score Curly at the 1996 CCRCA Specialty, and First place on the way to his Can CD. 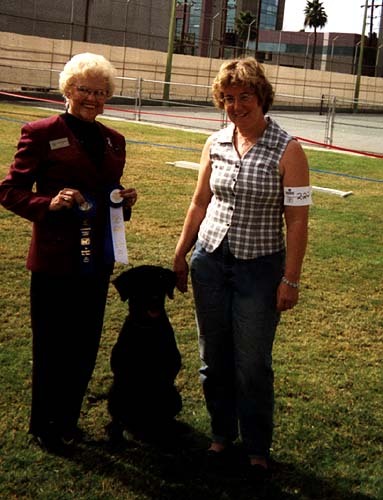 WCQ,SH,HR,ROMX,HOF winning HIT at the 2000 CCRCA National specialty from judge Betty Ribble. WCQ,SH,HR,ROMX,HOF winning back-to-back HITs in Mexico Jan 2002 from Shirley Indelicato.